This recipe combines two of the South’s favorite ingredients– pecans and bourbon–in a delicious pie. 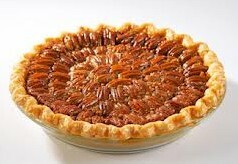 If you must, the bourbon may be omitted for a plain pecan pie. Roast the pecan pieces on a baking sheet in the center of the oven for 8 minutes only. While the pecans are hot, stir in 2 tablespoons butter and 1/8 teaspoon salt. Raise the oven temperature to 400 degrees F (204 degrees C). Boil 1 cup corn syrup, 3/4 cup brown sugar, 4 tablespoons butter, and 1/8 teaspoon salt in a medium size, heavy saucepan on medium heat for 3 minutes. Remove from the heat and let cool for 2 minutes. Stir together the arrowroot and water in a small bowl. Stir in the bourbon and 2 teaspoons vanilla. Stir this mixture well into the hot syrup. Stir the eggs and egg yolks together in a large bowl, then stir the hot syrup in a little at a time. Sprinkle pecan pieces over pre-baked crust. Pour the filling over the pecans and bake in the lower third of the oven for 35 minutes. If the crust edge is getting too brown, cover just the edge with foil. While the pie is baking, stir together and boil 3 tablespoons butter, 1/8 teaspoon salt, 2 tablespoons corn syrup, and 1/2 cup brown sugar in a medium-size, heavy saucepan for 1 minute. Remove from the heat and stir in pecan halves and 1/2 teaspoon vanilla. Arrange coated pecan halves on top of pie and return to the oven for 10 minutes. Note: A deep dish pie pan is 1-1/2 inches deep. If your pan is only 1-inch deep (standard), use a 10-inch pan for this recipe.